I finished Red Notice and I wanted to start right back at page one again. Read it, if you get a chance. Make the chance. This one’s important. John McCain of all people made me cry, in a good way. He’d been there. He knew. He did something about it. “What are you going to read next?” I was asked this evening. And so a shorter book that had been on my to-do list is also finished. For the author’s sake I am not going to name it here. Let’s just say it definitely suffered by the comparison and some books make me glad I like to knit. Before he died, my uncle, the late Senator Bob Bennett of Utah, told all his kids to read, “Red Notice,” by Bill Browder. Which one of them happened to mention on Facebook the other day in memory of her dad. I picked it up today and I finally made myself put it down just now with a third to go because there simply is no more time in the day. The man can definitely write. And Uncle Bob was right: everybody should definitely read this. A story I got to hear my dad tell last week. When Reed Smoot arrived in DC from the then-new state of Utah, his fellow Senators challenged him and refused to seat or have anything to do with him. And not only was he ostracized for being a Mormon, his wife was shunned, too, and she found herself very, very lonely in their new town. Note that my grandmother’s book tells of how, in the early 1950’s when she was the new Senator’s wife from that state, her husband being a freshman, she was expected to put on white gloves, a hat, and go from home to home in order of seniority of each of the other Senatorial wives bringing her calling card. One was to comply with longstanding tradition. My Western-raised grandmother found it all very strangely Victorian. The Smoots arrived nearly fifty years earlier. I imagine there were no such getting-to-know-yous–Mrs. Smoot’s presence was not wanted. My parents as newlyweds attended the same ward (Mormon congregation) in DC as the Smoots’ son. The President was throwing a party at the White House, and when the President threw a party, the protocol was that no one was to leave before he did. When the time was fully spent, Teddy Roosevelt announced that it was time for him to head upstairs to bed. He then turned to her and her alone and pronounced, “Good night, Mrs. Smoot!” Then away from the crowd and was gone. And that act of acknowledgement and kindness changed everything for her. I promised you guys and then forgot to post it after we got home–here’s Richard’s best picture of Elon Musk’s Space X. 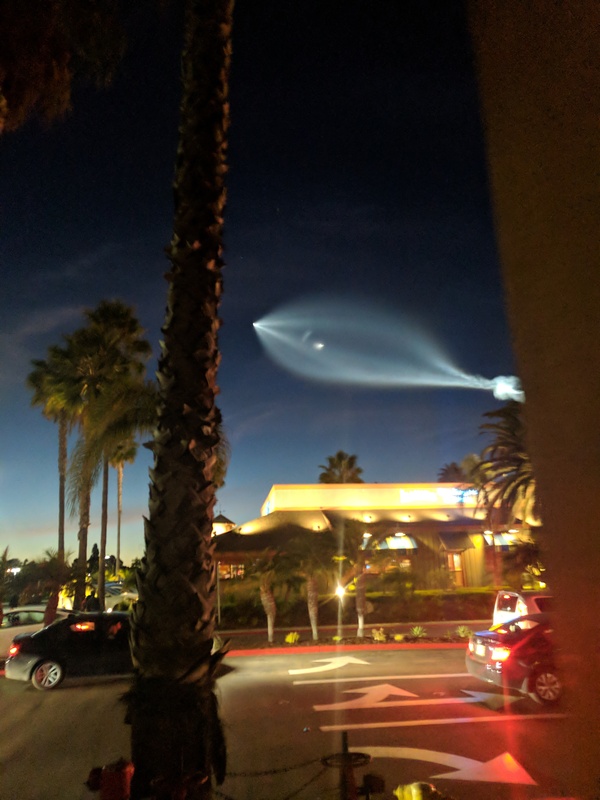 We were heading into a restaurant in La Jolla, 300 miles south of where this took off from, at the time we looked up to see why everybody else on the sidewalk was staring up into the sky. There was much speculation about what on earth that thing could be, till someone successfully Googled it. Doesn’t it look like a fish that swallowed a fish? Looks like you can embiggen the photo this time–scroll to the right. The bigger picture gives you a better sense of just how enormous this was in the sky to us. Alabama voted for Democrat Doug Jones, a good and decent man, over the demented, angry child molester. I get to open more presents tomorrow, but that was already the best one.